We hope that the following information will provide answers to the most commonly asked questions you might have. If for any reason you have any other questions, please contact our office and speak to one of our experienced staff. A: There are many factors that influence the cost of a custom closet system, including but not limited to the basic design concept, the size of the space, the number of drawers and doors, the material selected and the options that are specified. At Organized Home Solutions, we price each and every part individually in order to accurately establish your cost. Many other closet companies charge by the linear foot, which is a method that often results in higher pricing. During your free in-home consultation, your designer will create a custom design for you and give you our best price, up front, with no built-in padding for haggling purposes. Your designer will work with you to create a design that meets your needs at a price that is most affordable. Don’t forget to ask about our lowest price guarantee so that you know you are paying the best possible price in the market place when you are comparing. We play no games at Organized Home Solutions; you get a fair price, a great product and a tremendous value…guaranteed! Q: What makes Organized Home Solutions better than other closet companies? 1. All of our products are manufactured in a state-of-the-art facility, enabling us to closely control both the quality and delivery times for our products. 2. Unlike most other closet companies, we utilize a thick 2mm PVC edge banding as a standard feature. This is a major advantage as it distinguishes our product from the rest in terms of durability. Our 2mm edge banding is guaranteed never to chip or peel! 3. All Organized Home Solutions designs begin with an inventory of your belongings and a survey of your available space so that each and every closet can be utilized to the max for your individual requirements. No stock or modular solutions for your unique storage problems…truly a custom approach that costs you no more. 4. We use no subcontractors. 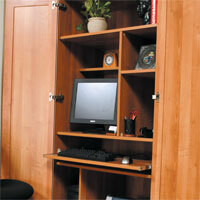 Every aspect of our process is accomplished solely by Organized Home Solutions employees. By not utilizing subcontractors, we ensure that our quality control is second to none. 5. We are an independent dealer for a national closet manufacturer and retail closet company; the largest and most successful closet company in the Philadelphia metropolitan area. Our combination of product quality and low pricing is so unique that in addition to their Philadelphia-area business, they currently wholesale their products to over 100 dealers in 22 states. This bears testimony to the true value that we can provide. 6. Unlike most closet companies that offer one or two colors and a couple of wood grains, Organized Home Solutions has 30 stock colors and wood grains from which to choose, as well as a wide selection of door and drawer front styles, options and accessories which enables true customization for our clients. 7. We have a network of national and local suppliers of some of the most advanced accessories in the market. We can provide every upgrade imaginable from crown moldings, dovetail solid wood drawer boxes, full extension ball bearing drawer slides, European hinges, raised panel doors and drawer fronts, several styles and colors of hardware including oil-rubbed bronze, chrome, brass and even black. 8. And if all that were not enough to distinguish us from our competitors, we also offer the lowest price in the Metro Detroit area, guaranteed! Q: Do your systems mount on the wall or do they sit on the floor? A: We do not believe that a company should offer you a closet system configuration that is based upon what is easiest for them to manufacture but, rather, we think that the construction method should be decided by what is most suitable for your unique application. In some instances, a floor-supported system is clearly superior. In other installations a wall-hung system might be advantageous. Design considerations and personal preferences should both be taken into account. At Organized Home Solutions we provide both floor-supported and wall-hung systems so that your job can be installed in the best possible manner, considering all appropriate variables. Q: How much does it cost for a designer to come to my home? A: We always offer a free, no obligation, in- home design consultation. Unlike many competitors, we will leave a copy of our design drawing with you so that you can consult with other family members who may not be present at the time of our visit. A: Professional installation is always included in our quoted price. While some competitors advertise “free installation this month only,” we think our customers are too smart to be taken in by such an obvious ploy. A: No way! 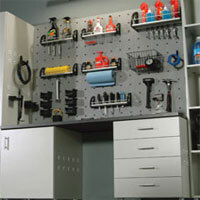 At Organized Home Solutions we can organize your life! We offer innovative designs and material solutions for offices at home or business, laundry rooms, garages, pantries, basements, kids rooms, kids furniture, entertainment centers, libraries… any place in your home that requires organization, better space utilization or storage. Q: How long will your installation take? A: Many of our installations can be completed in one day. We will generally schedule your installation within two weeks, except during particularly busy times. Obviously, very large jobs or very complicated jobs require more time. However, please keep in mind that as our craftsmen are installing your closet, it is not a race and we want to get it right! Q: Do you paint the closet? A: Our policy is to patch holes that we create as a result of removing the shelves and rods that may already be in your closet. We will spackle the areas we disturb and, if you provide touch-up paint, we will touch up those areas. Please note, however, that by no means do we consider this to be a paint job. Most customers recognize and accept that their clothes, once put away in the closet, will cover most of the disturbed areas and find this approach to be satisfactory. However, some customers want a truly “finished” look and to those customers, we suggest that you engage a painter to remove the rods and shelves and completely paint the walls prior to the arrival of our installation crew. Q: Do wood grain colors cost more? A: Yes, typically wood grain colors cost approximately 15% more than white or almond. This is due to the increased costs associated with the board and edge banding. Q: Do your closet units have backs? A: Typically, as is the case with almost all closet companies, your wall acts as the back of the unit. Unless there is a specific reason why a back may be needed or desired and unless it is clearly specified on your drawings, backs are not included. We can provide backs, should they be necessary, at an additional cost. Q: Do you have accessories for your closets? Q: Does your product come with a warranty? A: Yes. Organized Home Solutions offers a limited lifetime warranty. Organizing systems by Organized Home Solutions are manufactured with the highest quality materials and components to rigid quality standards and exacting tolerances. Organized Home Solutions standard component parts are warranted to the original purchaser for as long as they own the product. This warranty covers the products installed by Organized Home Solutions, Inc. in their original installation (without being moved) against defects in material and workmanship. The word “defects” as used in this warranty, is defined as imperfections that impair the utility of the product. This warranty is expressly limited to the repair or replacement of storage system component parts having defects. If a part is defective as per the terms of the warranty, Organized Home Solutions will repair the defective part or furnish a replacement part at no cost to the original purchaser. This warranty applies under conditions of normal use for the stated, intended purpose of the product. This warranty specifically excludes defects that result from intentional damage, negligence, installation by anyone other than an Organized Home Solutions installer, reinstallation or relocation of the system after initial installation, unreasonable use or exposure. This warranty applies only if all components and parts are manufactured, supplied by or installed by Organized Home Solutions. In addition, if the product you purchase from Organized Home Solutions is manufactured with our exclusive 2mm edge, it is warranted to the original purchaser that all edges covered by the 2mm edge material shall not chip or peel away from the board in normal use for the life of the product. All implied warranties arising under State law are limited in duration to ten (10) years. Some states do not allow limitations on how long an implied warranty lasts so this limitation may not apply to you. Q: How does your lowest price guarantee work? A: Organized Home Solutions guarantees our retail customers the lowest price available on any custom melamine system. We will beat any competitor’s price based on an “apples to apples” comparison. In order for this guarantee to be valid, our designer must be given the original design drawings and the original price quotation from any other closet company to review. Photocopies are not acceptable. Our designer will then point out any differences in the proposals and either beat the price or quote on the other company’s design to demonstrate exactly how we really compare, taking into consideration all variables such as design, material, edges, colors, etc. If for any reason we are unable to beat the competitors quote due to material differences, we will offer you our best possible price on our system. There really is a difference in closet systems and we think you owe it to yourself to compare! Q: How do I do business with Organized Home Solutions? A: First, call our office at 586.295.0505 to schedule an appointment with a designer. We will be happy to arrange for a free in-home design consultation with one of our professional design staff. The designer will come to your home or office, talk with you about your needs and desires, inventory your belongings, survey your space and create a personalized design that is responsive to your needs. When you are presented with your design, you will also be advised of the cost of the project. After any necessary fine-tuning or re-design you can place your order. If you choose to order at the time of the consultation your designer will ask you to sign the final drawings and our sales agreement form. If you decide to proceed after our designer has left, simply call the office and we will arrange to get you the necessary paperwork for your signature. Once we receive signed drawings, a signed sales agreement and a deposit, your order will be released to the factory for production. We will then call you to arrange a mutually-satisfactory installation date. Before you know it your life will become well organized, the Organized Home Solutions way. Q: What do I need to do before my installation? A: PRIOR TO INSTALLATION - Empty the closets, removing all of the contents and everything not attached to the walls prior to the arrival of our installers. If your closet had shelving, rods and supports when we measured and your installation quote includes the removal and patching of the walls with spackle, you will supply touch-up paint. Our installers will touch up the patch work only to the best of their ability. Please note that this touch-up is not a full paint job and that most of the patching and painting will be behind clothing or side panels. It is most likely that your walls will not be painted behind existing shelving or molding. If you are planning to paint your entire closet, you should arrange to have this done prior to our arrival, including the removal of all existing closet components. Remove all pictures, knick-knacks and the like from adjoining walls, as they may be shaken loose during installation. If carpet is to be added to the closet, please try to have it installed prior to our arrival. Carpet can be installed after the closet system but in most cases it is better if the carpet goes in first. Please make sure that we have easy access to the installation location and that other vehicles do not impede our carrying material to the closet. 1. If you would like to keep shelving or any of the components we remove, please advise our crew before they begin working and let them know where you would like it placed. 2. Please keep children and pets clear of the work area. 3. Our installation crew will build the system as per the plan that was part of our proposal. Any major changes or any additions that cannot be accomplished at the job site will entail an up-charge. 4. Please make sure that someone is present during the installation that can answer any questions or make decisions regarding placement of accessories. If no one can be present, please tell the installer in advance where you want these accessory items located if these locations differ from placement shown on the plans. 5. Upon completion you will be presented with an invoice. As per the terms detailed in our proposal, payment of the balance is now due. The installer will sign your copy of this invoice acknowledging receipt of payment. If you cannot be available when we expect to be finished, please arrange to leave payment or make other arrangements with the office in advance. Q: What else should I know about installation? A: Use it or lose it! · Anything with a stain that won’t ever come out, regardless of the claims of the products from Amazing Discoveries. · Anything with a hole that can’t be hidden or mended. · Anything that looks fine on the rack but that you can’t stand on your body. · Old shabby clothing or accessories that have sentimental value only. · Clothing that has been just a shade tight – for the past five years. · Shoes that are worn beyond repair – turned up toes, worn down to the max. · Clothing that is noticeably lower in quality from the things you are buying now. Go ahead, toss it, you’ll feel better! · Hang separates such as skirts, blouses and jackets in groups of similar items to help you see more combinations. · Do not stack or hang items that shed like angora or mohair near ones that attract like corduroy or velvet. · Do not hide things away in drawers that can be easily folded and displayed on open shelves. · Do not hang sweaters or knits; fold them to maintain their shape. · Store special occasion shoes in labeled boxes on higher shelves. Use lower shelves for everyday shoes. · Fold scarves flat and place on the shelf between your double hang sections. · Belts with large or awkward buckles that won’t fit on belt racks can be coiled and stored on shelves. · Store purses flat and loosely stuffed with tissue paper to retain their shape. · To avoid snags, store hosiery in clear plastic bags or dedicated hosiery drawers. · Do not squash too many items on a shelf or into a hanging area to avoid crushing or wrinkling. · Do not be hesitant to continually update your wardrobe by removing those items you rarely wear or may be out of date as you add more items. · Experiment! Move things around, try new ways to maximize your storage space while preserving the condition of your belongings. Q: If I move can I take the system with me? A: Yes, our systems are not only adjustable and changeable, they are also moveable. However, many clients find that custom built-in closets often increase the value of their home when they are ready to sell. A: We do not currently have a showroom, and have found that most of our customers prefer the convenience of our in-home consultations. Our designers can provide you with all of the literature, photographs, samples and drawings you might need to fully understand what you are buying. We do have plenty of shop and warehouse space to be efficient and organized. Please keep this in mind: a showroom and office facility means increased overhead. That equals higher prices to our customers. We have become successful by offering outstanding products and quality at a great price. We are committed to keeping it that way. Our office hours are from 9:00 to 5:30 Monday through Friday. We have weekends and evenings available by appointment.